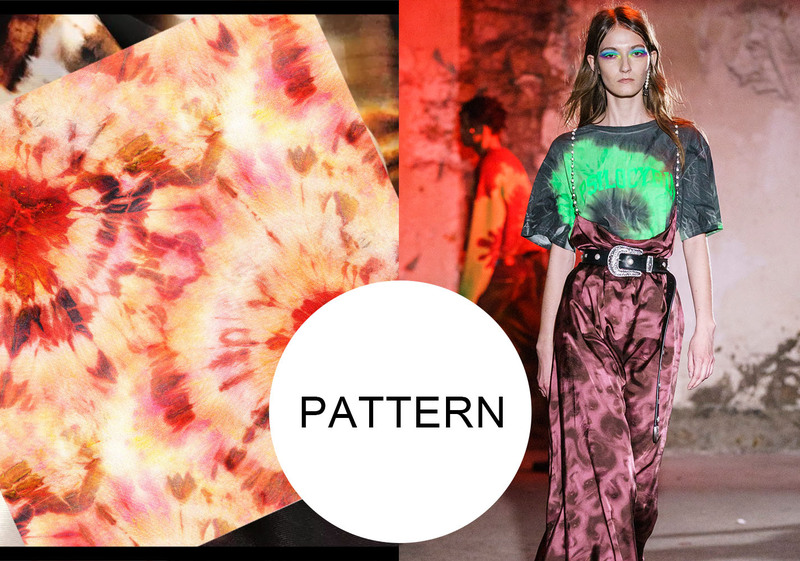 According to official data, on 2019 catwalks, the application of tie dyeing, including ombre and watercolor effects, increases by 102% on a year-on-year basis. Tie dyeing can be used to make ink-style stripes, textural pattern and ombre effect, which are ideal for prints in S/S. Insects are what children love. 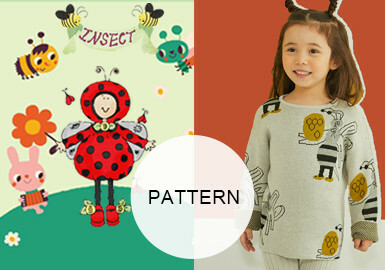 Catimini's special insect patterns and Gucci's vintage bee patterns liven up A/W. This report shows a variety of insects. There are a variety of letter patterns which are very common in fashion designing. Slogans can clearly express attitudes and opinions, which are favored by youths. Webbing and tape can decorate slogans. 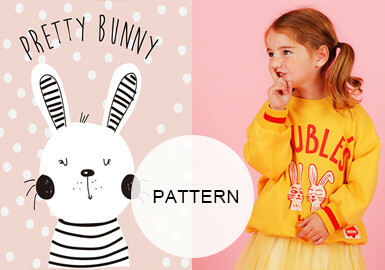 Cartoon figures are vibrant and lively, which are ideal for patterns for womenswear. Vintage styles are renewed, and refreshing and sweet styles are attractive. Large feline animals can also be sweet and playful. Fierce tigers and nimble leopards both attract great attention. This report helps you check out those charming animals. Eagle is often utilized for patterns on apparel. 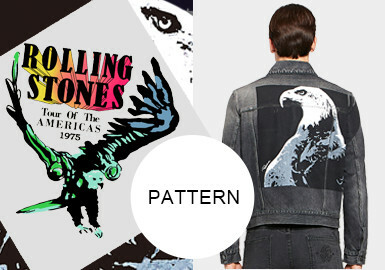 At the latest 19/20 A/W trunk show, eagle pattern is seen in many brands. Eagle silhouettes are combined with letters in different ways to show distinct styles. 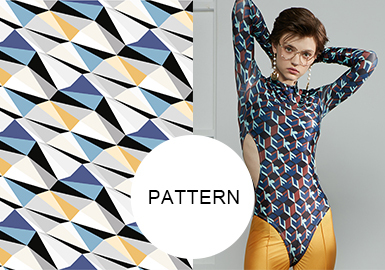 Geometrical patterns can also be matched with eagle patterns, which is fashionable for coats. Three-dimensional effect, fruits, letters, figures, watercolor, lines, new polka dots, color blocks. 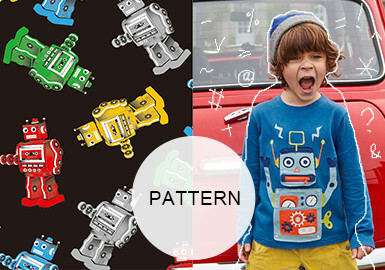 Iron robots could also be changed into sweet patterns. In this report, you will find sweet cartoon robots, vintage robots and futuristic robots. Music is a art to express our emotions. 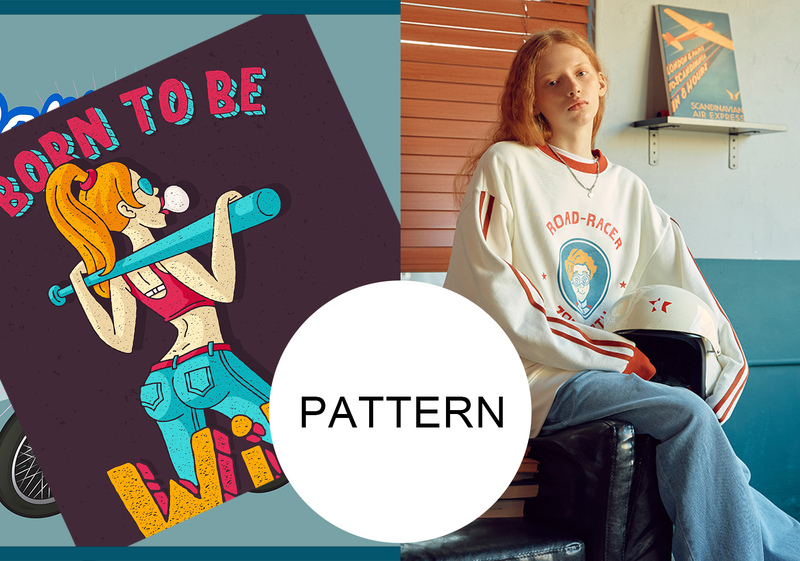 Musical patterns are simple and fashionable. Recorder, radio and phonograph brings a vintage style. In China, dragon represents good fortune. It is often seen on garments. 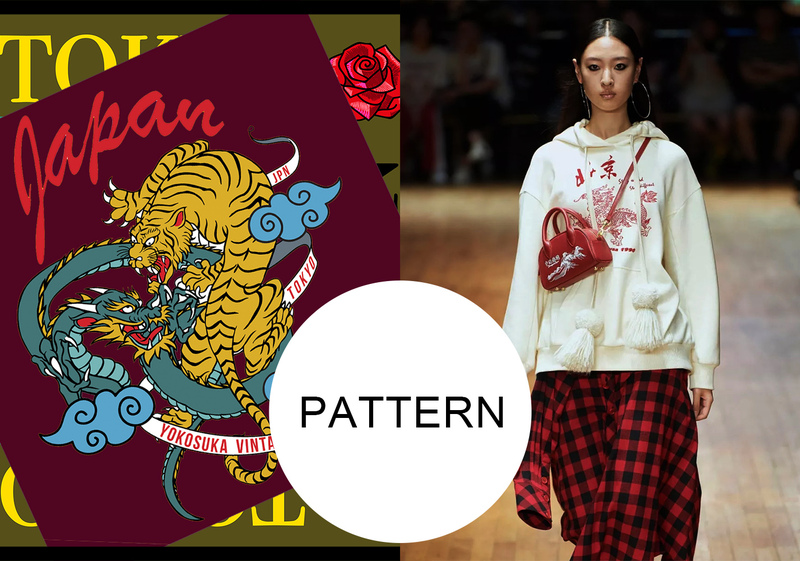 The adding of letters to dragon patterns is youthful and stylish. Hand-drawn characters are hot in recent seasons. 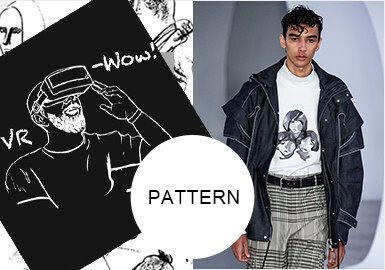 At 19/20 A/W catwalks, hand-drawn characters are still eye-catching. Sketchy characters are present on chest, and black and white comic characters and strange portraits are also appealing. 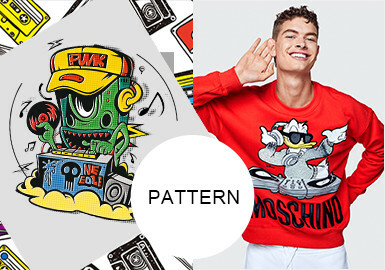 T-shirts and Sweatshirts are suitable for those prints. Old photos of city buildings, buses and beaches are combined with expressions and graffiti to form American resort patterns. 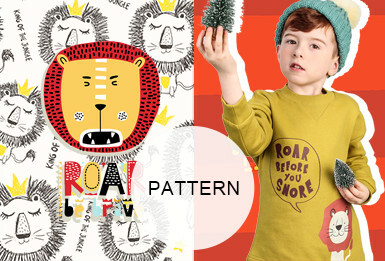 These patterns are suitable for boy's sweatshirts and T-shirts. This report collects and analyzes styles and patterns of Molo, Mayoral, Ikks and Zara. Sketchy patterns are refreshing and common. Funny portraits are very popular in fashion. Simple color blocks and lines could depict characters very well. 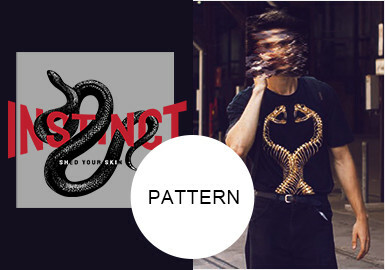 Snake patterns are widely used by many fashion brands. Snake can be bent into many shapes. It goes around letters, forming original and novel patterns. The adding of geometrical shapes and letters makes snake patterns more lively and attractive. In autumn and winter, rabbits deliver a warm image, which is liked by most people. This report includes a variety of rabbit patterns. Arabic numbers are popular all the time in fashion industry. Simple and clear numbers can be versatile. Numbers could be combined with letters and flowers. The vintage style and illustrations could add interest. 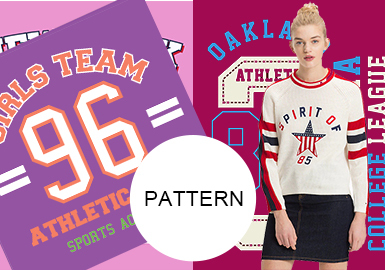 Stylish numbers liven up items. Black and white are timeless in fashion industry. The contrast between black and white is simple and clear, exuding a refreshing feel. Just like independent people who never pursue so-called fashion and dazzling colors, black and white has its own special qualities. At the latest 19/20 A/W catwalk, Jeremy Scott almost just uses black and white. Large letters and graphics are applied in a large scale to show a contrasting effect. 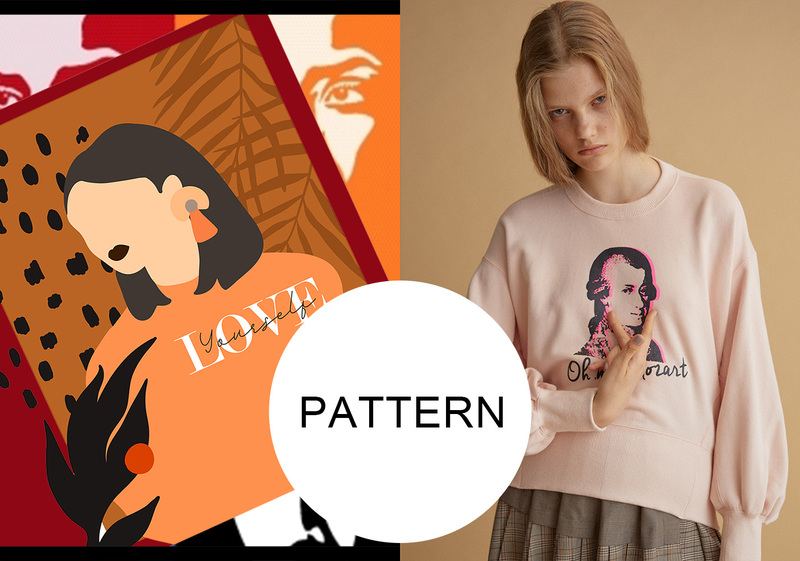 Hearts are very common for garment patterns. It can be applied separately or combined with other elements. 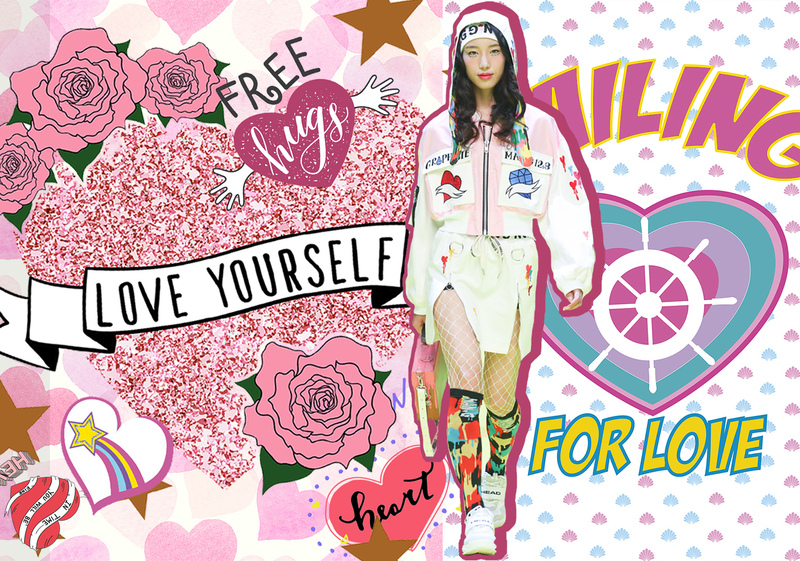 The adding of letters are fashionable, which is in line with the current fashion trend. Floral patterns are romantic and refreshing. There are sweet dinosaurs, sweet dinosaurs and fierce dinosaurs. 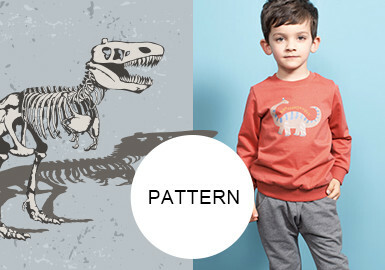 Dinosaurs are doubtlessly ideal for kidswear patterns. In this season, we are surrounded by all kinds of dinosaurs again. Catimini, Molo and Paul Smith brings us a variety of dinosaurs before us. 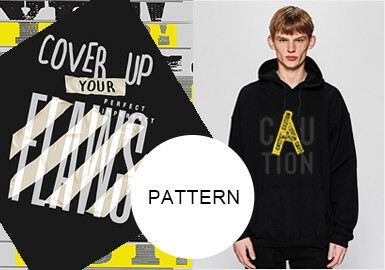 Animal patterns are prevalent, and they are often seen on street snaps and catwalks. Tiger and leopard are the most popular animals. Many brands prefer using leopard print. 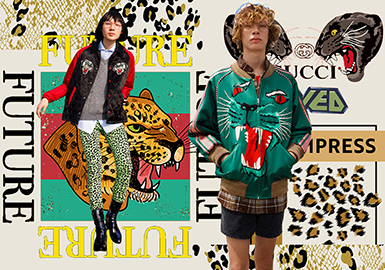 Gucci employs cartoon leopards in an all-over way or on chest. The color matching delivers Gucci's unique style. Leopard print is also present on many other brands. It can be combined with letters; splicing of leopard print and other animal prints are uniquely fashionable. I want to travel around this big world. Different places have different customs and buildings. 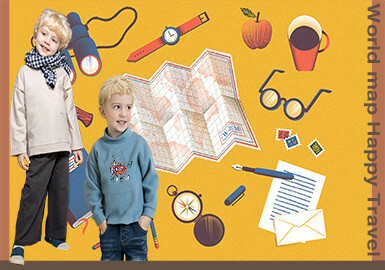 IKKS and Alviero Martini, in this season, show us the application of different maps. Let us start our journey to explore the possible. 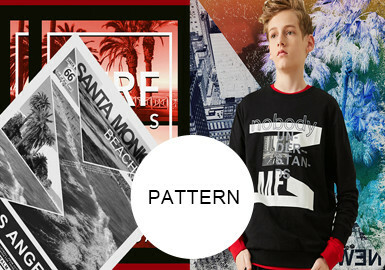 City views and natural landscape are combined with letters to be fashionable patterns. City views can be photos or sketchy pictures. Different methods can enrich images. With the prevalence of animal patterns, all kinds of animal elements are often present in street snaps and fashion shows. Currently, the most prominent animal is jaguar, which is applied by Just Cavalli and Gucci. The nimble body and roaring team with flowers and numbers and letters to create a sketchy or realistic effect. There are lots of styles and unique jaguar elements, so there must be one ideal style for you to express your attitude.